bl.uk > Online Gallery Home	> Online exhibitions	> Asia, Pacific and Africa Collections	> The Noa Nuddee. 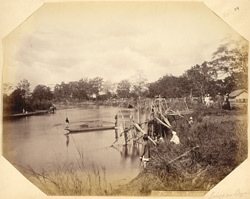 View looking along a river and embankment in Assam taken by Oscar Jean Baptiste Mallitte in the 1860s. There are various activities taking place on the river and riverbank, buildings are visible through trees in the distance and a European couple are standing on the right. An annotation which probably identifies the precise location is unclear but may read: 'Singree'.